Category: Characters, Disney, Girls, Princesses & Royal Highnesses. Posted in Characters, Disney, Girls, Princesses & Royal Highnesses. 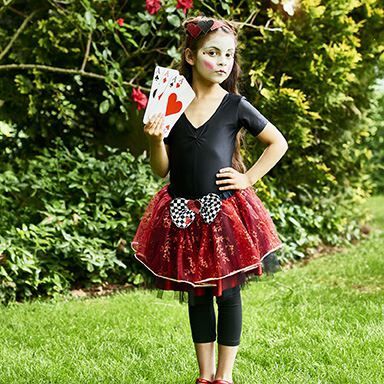 Tagged as Queen of Hearts, Travis Designs, Tutu Set. A stunning tutu in dramatic red and black layers consisting of a top skirt in sparkling glitter print tulle, edged in white sequins, sitting over layers of black tulle. The skirt is finished at the waistband with a black and white chequered bow with a red glittered heart.